If you want a CBD capsule that has no psychoactive properties, then you have just found one. These medicinal hemp capsules, are intended to improve both body and mind, to allow you to live your best life. Each CBD capsule contains 35 mg of CBD, extracted from organically grown hemp plants. The CO2 extraction of CBD ESSENCE’s capsules is an EU Certified technique, and other ingredients which are incorporated include organic sunflower lecithin and organic virgin coconut oil. Chronic pain: People who experience chronic pain have to suffer everyday and may find that mainstream prescription pain relievers are ineffective. However the CBD capsules can be a great alternative as they contain medicinal hemp oil, which is known to have a therapeutic effect on the body and mind. Depression: Anxiety and depression are just two of the many mental illnesses that can seriously affect one’s health. Over-the-counter pharmaceuticals are highly addictive, and that’s why people are opting for a more natural treatment. The CBD Medicinal Hemp capsules can come in handy since they have a therapeutic and anti-depressant effect, which will help you calm down and get quality sleep – essential for those fighting depression. Heart health: These CBD capsules may have several benefits to the heart, including lowering blood pressure and aiding in blood circulation. This is because the chemical CBD has stress and anxiety reducing properties, which in turn help in lowering blood pressure. Antipsychotic effects: This CBD product has been certified, and approved to be very crucial in helping people with mental illness by reducing psychotic symptoms. Acne treatment: CBD oil inhibits the production of sebum in the sebaceous glands on the skin and this can help in acne treatment. These capsules contain top-quality CBD oil, hence they are great for treating the condition. Quality: These CBD capsules can be confidently described as a high quality product; the CO2 extraction process ensures the extract is very pure. Cannabidiol (CBD) oils from CBD ESSENCE are tested by other labs to ensure that their products are of the best quality and to reassure their clients of what they’re purchasing. Effects: Hemp Oil Capsules contain 35 mg CBD per capsule. This is very effective for certain medicinal purposes such as the ones listed above. The CBD Medicinal Hemp Capsules come with either 30 capsules, 60 capsules, 90 capsules, or 120 CBD capsules. The 30 CBD Medicinal Hemp Oil costs $74.00 and has a total of 1050 mg. The 60 CBD Medicinal Hemp Oil costs $134.00 and has a total of 2100mg. The 90 CBD Medicinal Hemp Capsules costs $179.00 and has a total of 3150 mg. The 120 CBD Medicinal Hemp Capsules costs $229.00 and has a total of 4200mg. 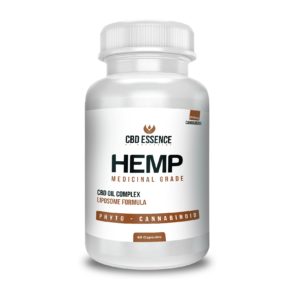 You can easily buy CBD Capsules Medicinal Hemp Oil Liposome online by clicking on https://hempworldstore.com/cbd-essence-brand-review/, or by visiting the official website of CBD ESSENCE. Final thoughts: These are one of the best CBD capsules in the market for chronic pain, inflammation, anxiety, depression, and heart health amongst others.